READ IT ON A PDA. lthough the threat of atomic warfare hung over us constantly when I was a boy in Babbington, New York, clam capital of America, we didn’t think about annihilation all the time. Sometimes we worried about war and rumors of war, it’s true, but at other times we had other thoughts: we fell in love, pondered the meaning of life, and went about the mundane business of living it, and grown-ups tried to calm the fears of their children by living ordinary lives and doing ordinary things—going to work and dusting the furniture and making us eat our peas. The peas favored in my family throughout my childhood and adolescence were the Troubled Titan brand, the same brand served in the cafeteria of the Purlieu Street School. They were gray-green, smoothly spherical, without the dimples or wrinkles of, say, raisins, and so uniform in size that they might have been an artificial foodstuff manufactured at the Troubled Titan’s factory—replicas of a single master, an archetypal pea—rather than something that sprang from dirt and formed in pods. They arrived at the school already cooked, in enormous cans, each can wrapped in a sleeve of silver paper, imprinted with a picture of the Troubled Titan. They were what was called a “heat ’n’ eat” type of food. Behind the scenes, in the kitchen of the cafeteria, someone opened the cans and poured the contents into one of the large rectangular warming trays that fitted into the steam table. Ready in a jiffy! Wishing you could find a way to support this work? Post reviews of the books. 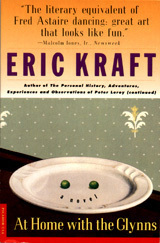 Go to one of the online bookstores and contribute your own review of one of Kraft's books. The links below will take you directly to the individual book locations at Amazon.com and Barnes&Noble.com. Once you're there, you'll see a button labeled "Write a Review" or something like that. At Home with the Glynns is published in paperback by Picador, a division of St. Martin's Press, at $11.00. At Home with the Glynns is a work of fiction. The characters, incidents, dialogues, settings, and businesses portrayed in it are products of the author's imagination and are not to be construed as real. Any resemblance to actual events or persons, living or dead, is entirely coincidental.